In anticipation of an eventual political transition in Cuba, two Cuban-American engineering associations, the Cuban-American Association of Civil Engineers (C-AACE) and the Association of Cuban Engineers (ACE), have continued to sponsor their joint Cuba Water and Wastewater Infrastructure Committee. At the 2008 annual conference of the Association for the Study of the Cuban Economy (ASCE) two of the coauthors of this paper presented an overview of environmental, institutional and economics issues (Solo- Gabriele and Perez, 2008). This paper concentrates on priorities. We anticipate that under a political transition, external financial aid (i.e., grants) for infrastructure may be available for only a relatively short period of time, after which financing for infrastructure projects will need to be obtained as loans from international lending institutions such as the Inter-American Development Bank. One objective of this paper is to provide guidance for identifying and prioritizing water/wastewater infrastructure needs for Cuba, so that resources can be allocated efficiently during the anticipated periods of international aid and lending. Another objective is to illustrate, via a case study, some sensible choices of incremental wastewater treatment processes; to provide approximate cost information; and to discuss the estimation of economic benefits. As a starting point for prioritizing water and wastewater improvements we briefly describe the water resources within the country and describe the eight priority watersheds on the island as identified by Cuban Institute of Hydraulic Resources (Instituto de Recursos Hidráulicos)(García Fernández 2006). Specific detailed priorities are identified for one of the eight priority watersheds which is located in the capital city of Havana, namely, the Almendares-Vento watershed. One of these priorities (illustrated in the case study) is the treatment of domestic wastewater from the Town of Cotorro, the waste of which currently flows directly into surface waters which are hydraulically interconnected with the Vento Aquifer, the primary potable water source for the population of Havana. As a first step, we estimate the cumulative cost of each phase of the Cotorro project (that is, diversion of untreated wastewater to another watershed, primary treatment, secondary treatment and tertiary treatment). Also, for each phase we present a conceptual methodology for estimating the economic benefits of each incremental level of treatment. We believe a costbenefit approach, such as that outlined for the case study, should be used for prioritizing water and wastewater infrastructure investments within the Almendares- Vento watershed as well as for the remaining watersheds within Cuba. 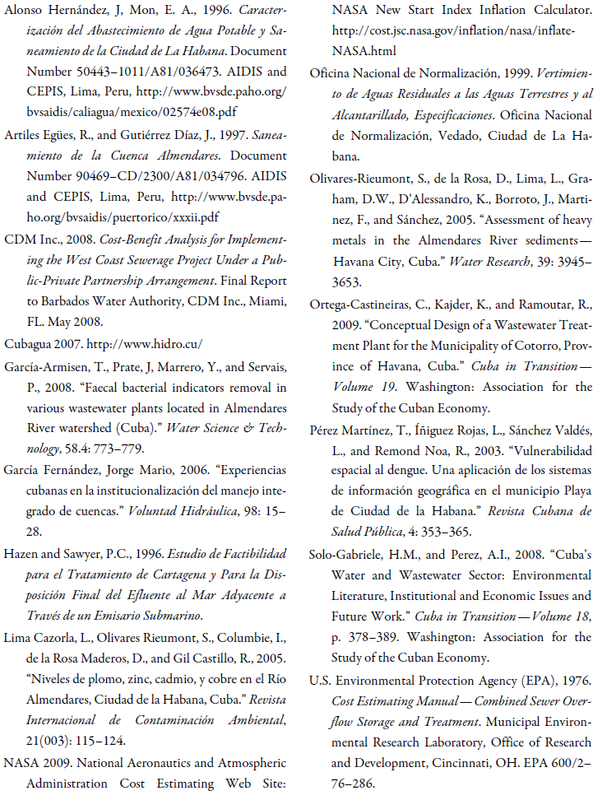 The previously-cited paper (Solo-Gabriele and Perez, 2008) contained a discussion of the water resources in Cuba. Essentially, the seasonality of rainfall, and the rapid movement of water from topographic ridges to the coast, limits the availability of water for the population and for other uses. The water demand may be approaching its maximum “safe yield” supply (i.e., the flow that can be withdrawn annually without depleting the resource long-term). Many of these issues are discussed by García Fernández (2006). He calculated that that the availability of water is 1220 cubic meters per person per year (i.e., slightly over 3 cubic meters per person per day), which he indicates is a very low per capita number according to the World Meteorology Association and the United Nations’ Environmental Program. Hence, there is a need to carefully evaluate the rational use of water. He also mentioned the importance of ecological issues, such as the need to maintain fisheries and biological diversity. Accordingly, Cuba has created a set of Watershed Councils, whose activities are currently coordinated by the National Council of Watersheds, under the auspices of the Institute of Hydraulic Resources. García Fernández (2006) describes eight watersheds which have been prioritized by Cuban government officials. These watersheds are the Almendares-Vento, Ariguanabo, Cauto, Cuyaguateje, Guantánamo- Guaso, Hanabanilla, Toa, and Zaza (Table 1). 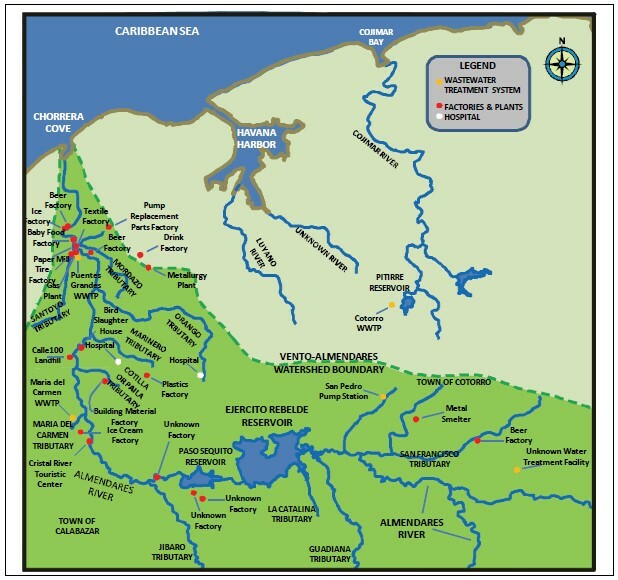 Two of the watersheds, the Ariguanabo and the Almendares- Vento, are located immediately adjacent to one another (Figure 1). According to García Fernández (2006), these eight watersheds account for only approximately 15% of Cuba’s territory, yet encompass 40% of the island’s population and 60% of the national economic activity. He reported that as of the end of year 2004, for the eight watersheds in the aggregate, the coverage of potable water supply was 85% and the coverage of sanitation systems was 86%. 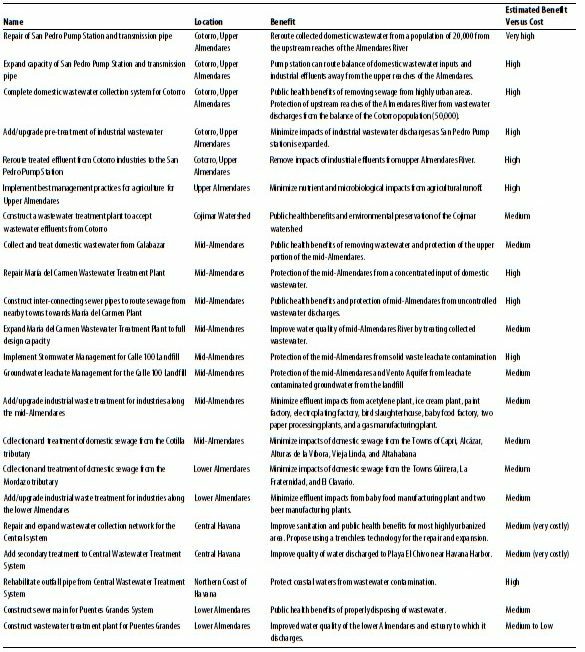 The issues affecting the different watersheds are varied, as summarized below and in Table 2. Figure 1. Eight Priority Watersheds (boundaries highlighted in shaded gray) with respect to provinces boundaries (gray lines) and location of major cities (circles) within Cuba. The Almendares-Vento watershed (402 km2 watershed area, 570,000 resident population) includes the Almendares River and its underlying aquifer, Vento. 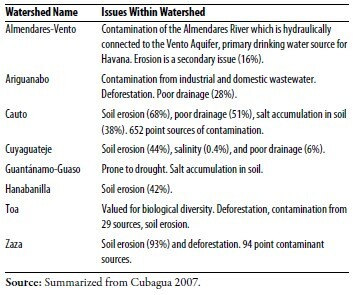 Problems identified within this watershed include contamination of the Almendares River which is hydraulically linked to the Vento Aquifer, the primary source of drinking water for the population of Havana, and erosion (Table 2). The Almendares-Vento watershed is closely linked to the Ariguanabo watershed (188 km2, 90,000 population) which is located immediately adjacent to the southwest. The aquifer located below the Ariguanabo watershed also serves as a significant source of potable water for the City of Havana and is also hydraulically linked to the Vento (Cubagua 2007). The rivers within the Ariguanabo watershed, notably the San Antonio River, are contaminated with industrial and domestic wastewaters which are either poorly treated or not treated. The Cauto watershed (9,540 km2, 1,167,400 population) is the largest in Cuba. Problems in this watershed include soil erosion (affects 68% of the watershed area) and poor drainage (51%), and degradation of soil through salt accumulation (38%). Six hundred and fifty- two point sources of contamination have been identified in this watershed, of which 140 are considered to be very problematic, including sugar processing waste, coffee processing waste, other industries, and domestic wastewater (Cubagua 2007). The Cuyaguateje River (795 km2, 40,210 population) is located in Pinar del Río. Primary problems within the watershed include erosion (44% of the area is affected) and poor drainage (6% affected). The Guantánamo- Guaso watershed (2,347 km2, 410,000 population) is known for its drought conditions, with some areas receiving less than 100 mm of rainfall per year. The Hanabanilla watershed (287 km2, 7,000 population) is located in the mountainous terrain of the Villa Clara and Cienfuegos provinces. A unique characteristic of this watershed is its large hydroelectric plant and man-made reservoir. Water quality is very good in the reservoir and it thus serves as a potable water source. The primary issue in this watershed is soil erosion. The Toa watershed (1,061 km2, 12,300 population), located in the Holguín and Guantánamo provinces, is known for its biological diversity and unique ecosystems. The watershed is characterized by low population density. A small hydroelectric plant is located within its boundaries. The primary environmental problems in this watershed are deforestation and soil erosion. Twenty-nine significant contaminant sources have also been identified within this watershed. 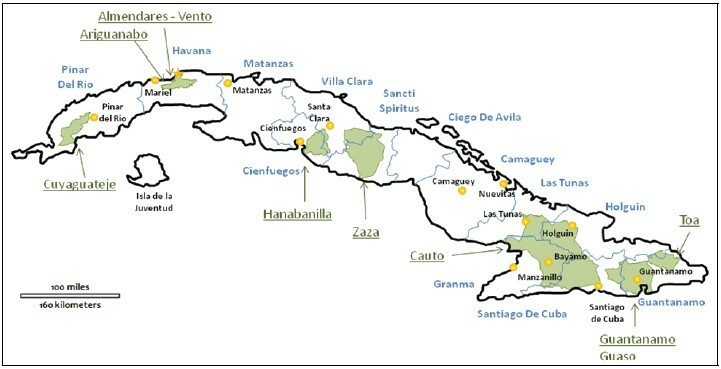 The Zaza watershed (2,413 km2, 264,150 population) is located within the Villa Clara and Sancti Spíritus provinces. This watershed suffers from soil erosion within 93% of its area. Ninety-four significant sources of contamination (most with little or no treatment), notably from sugar and other agricultural operations, are found within this watershed. A significant shrimp aquaculture industry is found at the mouth of the Zaza River along the coast (Cubagua 2007). Among the eight priority watersheds, those located in the Province of Havana (Almendares-Vento and Ariguanabo) have by far the highest population density, 1,420 and 480 inhabitants per km2 of watershed area, respectively. Due to the significant concentration of people and industry within the Almendares-Vento watershed, we use it as a case study illustration for more details with respect to prioritization, as we anticipate that investments in infrastructure improvements will benefit the greatest number of people. Moreover, the study of this watershed is facilitated by the fact that there is generally more information about it than for other watersheds in Cuba. Although this paper focuses on the Almendares-Vento watershed, we emphasize here that there are many water- related needs throughout Cuba. Basic needs throughout the island include first and foremost obtaining a supply of sufficient quantity of water to service the population. This water should be of good quality and treated to further improve its quality. The water should be supplied continuously during 24 hours a day and the service should be under continuous positive pressure within the distribution system to prevent contamination of the water during times of low water pressure. Currently in Cuba, water is not supplied continuously, which requires individuals to store water in containers. The limited quantity of water is critical in Santiago de Cuba. The quality of the available water throughout Cuba is hampered by the lack of water treatment chemicals, inoperative chemical dosing equipment, lack of sand in filters, water plants in overall need of repair, poor quality of the distribution systems, lack of monitoring, and the proliferation of cisterns in individual homes. In all of the provinces, within a majority of the distribution systems, water is available on alternating days. The provision of water is through water tanker trucks, in many cases, even when the homes are serviced by water supply lines, because the water simply does not reach all of the extremes of the water distribution system. The water distribution systems throughout Cuba are characterized by a large amount of leaks. The prevalence of leaks makes it almost impossible to maintain adequate and continuous water pressure within the system. Assuming that sufficient water is available, the cycle of the provision of safe drinking water begins with preservation of source water quality. Preservation of source water quality depends highly upon proper treatment and disposal of wastewater. Once the quality of the source water has been secured, then the provision of water to the general public includes its treatment, which for groundwater sources should at least include disinfection and for surface water should at least include filtration plus disinfection as a minimum, with supplementation with coagulation and flocculation. Once treated, the water is then distributed to the population. This water is consumed and converted to wastewater, which should be treated properly. The effluent from the wastewater treatment process is to be ultimately disposed in a safe manner which prevents contamination of the water supply sources, thereby closing the cycle for the provision of safe drinking water. Given the cycle for the provision of safe drinking water, the infrastructure conditions and priorities are discussed sequentially under the following headings, namely: protection of water sources via wastewater collection/treatment, and the treatment and distribution of potable water. The Vento Aquifer, which is hydraulically connected to the Almendares River, is the primary source of drinking water to the City of Havana, providing water to 47% of the local population (Olivares-Rieumont et al. 2005). The hydraulic connection is due to the permeable Karstic limestone which underlies the Almendares River, allowing for the waters from the river to infiltrate to the aquifer below (Artiles Egües and Gutiérrez Díaz 1997). This aquifer, and consequently its overlying river, the Almendares, should be protected from contamination, especially in the mid and upper areas of the watershed, upstream of the Ejército Rebelde reservoir. This reservoir cuts into the Vento Aquifer and because of its depth, the reservoir can serve as an additional and significant conduit for contaminants to reach the aquifer. Unfortunately, the Almendares-Vento watershed is impacted by wastewater discharges throughout its length (Figure 2). Lima Cazorla et al. (2005) estimate roughly 70 point sources of contamination to this river system. The most critical of these discharges are the ones located in the upper reaches of the watershed, as these contaminants are carried downstream, thereby impacting the potable water sources. Artiles Egües and Gutiérrez Díaz (1997) separated the Almendares River into three regions, the upper Almendares (upstream of the train bridge at Lenin Park), the mid-Almendares (between the train bridge and the confluence of the Almendares River with the Mordazo tributary) and the lower Almendares (downstream of the confluence with the Mordazo tributary). These regions are described below. Upper Almendares Region: The upper Almendares suffers impacts from domestic wastewater, industrial wastewater, and agricultural runoff including runoff from pig and cattle farms (Lima Cazorla et al. 2005). About one-fourth of the domestic wastewater from the Town of Cotorro (total population of 74,500) is collected. The rest is permitted to run off into the nearest waterway which ultimately makes its way in the upper reaches of the Almendares River. The original intent of collecting the wastewater was to pump it to El Pitirre Reservoir located outside of the Almendares- Vento watershed; however, due to an inoperative pump station (Alonso Hernández and Mon 1996) this wastewater instead enters the San Francisco River (which ultimately flows into the Ejército Rebelde reservoir). Within the industrial wastewaters, the metallurgy center, including a nonferrous metal smelter (Antillana de Acero) and its secondary foundries, are of particular concern. Not only do the metallurgy-related industries appear to discharge poorly treated residual effluents directly to the river, they also impact water quality through metal-laden air emissions which deposit within the watershed and are carried to the upper reaches of the Almendares River by stormwater runoff (Lima Cazorla et al. 2005). Other industrial discharges to the San Francisco River include a milk processing plant (Combinado de Productos Lácteos), two rubber processing plants (Fábrica de Perfiles de Goma, Fábrica de Productos de Goma), a textile processing facility (Textilera Facute), plus a tannery, and a battery factory (Artiles Egües and Gutiérrez Diaz 1997; Olivares-Rieumont et al. 2005). Mid-Almendares Region: Most of the flow during dry periods (100 L/s) within the upper portion of the mid-Almendares is composed of raw domestic wastewater and untreated or poorly treated industrial wastewater. After passage through the Town of Calabazar the Almendares River receives inflow from the Jíbaro tributary, which receives waste from an acetylene plant. Upon the confluence with the Jíbaro tributary (300 to 600 L/s during the dry season), the river appears to assimilate the upstream wastes, as BOD5 levels at this point are generally at levels of 10 to 20 mg/L and dissolved oxygen levels are at generally acceptable levels of 4 to 6 mg/L. Upon crossing the bridge of the Rancho Boyeros Highway, the river receives poorly treated wastewater from the Tourist Center (Rio Cristal), from an ice cream production plant (Coppelia) located in Capdevila, and from the María del Carmen wastewater treatment plant. In the vicinity of this area, Olivares-Rieumont et al. (2005) have also identified effluent impacts from a paint factory, an electronics/ electroplating plant, a building materials facility, and from the largest solid waste facility in Havana (Calle 100) which accepts both domestic and industrial solid wastes and which contributes contaminants to the river (Lima Cazorla et al. 2005). The next tributary contributing to the Almendares River is the Cotilla. This tributary receives domestic wastewater from the Towns of Capri, Alcázar, Alturas de la Víbora, Vieja Linda, and Altahabana. It also receives industrial wastes from a bird slaughter facility (Combinado Avícola Nacional) and from a baby food manufacturing plant (Taoro factory). Immediately downstream of the Husillo dam is the confluence with the Santoyo tributary which provides a considerable amount of dilution capacity, with flows characterized by relatively good water quality at rates between 300 to 500 L/s. Downstream of the Husillo dam is a tire manufacturing plant, a paper-waste processing plant (Papelera Moderna), a gas manufacturing plant (Planta de Gas Manufacturado Mario Fortuny), a carbon gas manufacturing plant (Planta de Gas Carbónico), and a second paper-waste processing facility (Papelera Cubana). Immediately before the confluence with the Mordazo tributary, the Almendares River, with a flow of about 2 m3/s, is characterized by significant levels of contamination (BOD5 of 30 to 50 mg/L, dissolved oxygen of 2 to 3 mg/L) (Artiles Egües and Gutiérrez Díaz 1997). Lower Almendares Region: The Mordazo tributary (flow rate of 1 m3/s) receives domestic wastewater from the towns of Güinera, La Fraternidad, and El Calvario plus wastewater from a beer manufacturing plant (Cervecería Miguel Oramas). After the confluence with the Mordazo tributary, the Almendares receives industrial wastes from a baby food manufacturing facility (Fábrica de Compotas Ositos) and from another beer manufacturing facility (Fábrica de Cerveza Pedro Marrero). From the 23rd Avenue Bridge to the outlet at Chorrera Cove the water is devoid of oxygen, gray in color, and characterized by a considerable amount of floating solids (Artiles Egües and Gutiérrez Díaz 1997). 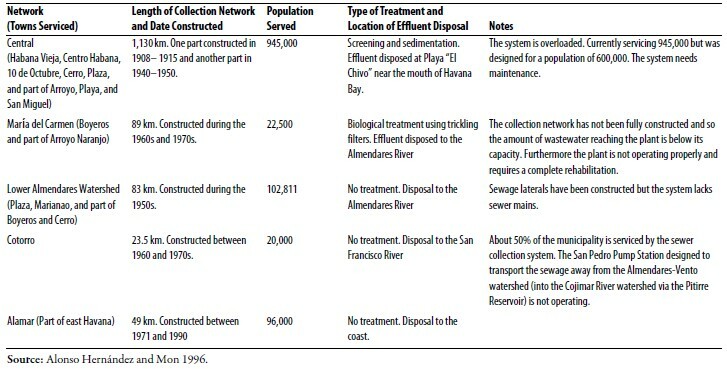 Condition of Wastewater Collection/Disposal Networks: The collection and disposal of domestic wastewater for the City of Havana, separated into five primary networks (Table 3), consists of about 1570 km of sewer mains and laterals, 23 pump stations, 2 wastewater treatment plants and 15 stabilization lagoons (Alonso Hernández and Mon 1996). The 5 networks service about 1.2 million people, or 55% of the population of the city. Smaller wastewater collection networks service another 253,800 inhabitants (12%) and septic tanks provide service to another 580,000 inhabitants (26%), with the remaining 170,000 inhabitants (7%) without service (Alonso Hernández and Mon 1996). Artiles Egües and Gutiérrez Díaz (1997) identified a sixth collection network. This network, referred to as “Puentes Grandes,” is presumably located at the Puentes Grandes bridge at the Mordazo tributary. The Puentes Grandes system is designed to collect wastewater from a population of 150,000 to 200,000. About 80% of the homes within this community have already been connected to wastewater lateral pipes; however, the main trunk line for this collection network was never constructed, nor has the wastewater treatment plant which was planned to service this network been constructed. Thus, given the information available, it seems apparent that the Puentes Grandes system accounts for most of the uncontrolled domestic wastewater discharge within the City of Havana. The wastewater collection and treatment network within the City of Havana is in dire need of expansion and repair. The largest network, the Central network, is extremely old (with sections which are nearing 100 years) and overcharged, currently servicing a population of 945,000 although it was originally designed for a population of 600,000. Treatment of the wastewater from this system is limited to sedimentation and there are questions about the integrity of the ocean outfall pipe which carries the partially treated wastewater out to the coast at Playa El Chivo on the east side of the mouth of Havana Bay. The other remaining systems are about an order-of-magnitude smaller, servicing populations between 20,000 and 100,000. The network with the most advanced treatment system, the María del Carmen Plant (consisting of primary sedimentation, a trickling filter, a secondary sedimentation basin, and sludge digestion), does not have an adequate wastewater collection network as wastewater mains interconnecting the service areas were never constructed. Thus only a portion of the wastewater collected is transported to the plant. Moreover, the wastewater treatment plant is not operating properly (Artiles Egües and Gutiérrez Díaz 1997). Artiles Egües and Gutiérrez Díaz (1997) state that the plant was to be constructed in two phases, the first providing treatment for 300 L/s and the second providing treatment for another 300 L/s, for an ultimate total capacity of 600 L/s. For a population of 20,500, we estimate that the actual flow rate received at the plant is approximately 170 L/s which is significantly below the design flow rate for the phase 1 design. Wastewater from the remaining three wastewater collection networks goes untreated. Of special concern is the current wastewater disposal situation from the Town of Cotorro, for the reasons described earlier. The wastewater collection network for the Town of Cotorro serves 20,000 of the 72,000 population (Artiles Egües and Gutiérrez Diaz 1997). The original plan was to pump the wastewater that was collected for the 20,000 sub-population out of the Almendares-Vento watershed via the San Pedro Pump Station and then treat this wastewater within the Pitirre stabilization lagoon. However, the San Pedro Pump Station is inoperative. This situation greatly increases the vulnerability of the water supply to contamination. Wastewater Priorities: Priorities for protecting the water supply for the City of Havana include first and foremost repairing the San Pedro pump station. Available information suggests that the pumps are in working condition; however the wiring and control panels are in need of repair. We also recommend the expansion of the wastewater collection network for Cotorro to service the remaining domestic population and the industries within the area (in particular the metal processing plant and other related industries). A summary of the source water protection needs is provided in Table 4, including a qualitative, judgment-based estimate for the benefit versus cost relationship of each project, expressed in terms of high, medium, and low priorities. Furthermore, Artiles Egües and Gutiérrez Díaz (1997) provide a more detailed priority list of the wastewater collection needs with references to specific wastewater mains that are in need of construction and/or repair. Possibility of Using “Natural” Wastewater Treatment Systems: With respect to treatment facilities for wastewater, García-Armisen et al. (2008) recommend the use of natural systems (such as constructed wetlands and solar aquatic systems) for Havana. In their study they compared the operation of three plants in Havana, a constructed wetland which services 3000 people with an average flow rate of 6 L/s, a solar aquatic system which services 5000 people with an average flow rate of 10 L/s, and the María del Carmen trickling filter plant which services between 20,000 (Alonso Hernández and Mon 1996) and 50,000 (García- Armisen et al. 2008) people with an average flow rate of 170 L/s during the time of the study. Their results showed that the effluent quality from the constructed wetland and solar aquatic system was much better than the quality from the more complex María del Carmen plant. They attribute this difference to simpler operation of the natural systems. They also emphasize that the capital costs and maintenance are generally lower for the natural systems and thus these systems may be more suited for developing countries such as Cuba. However, it is important to note that the natural systems tend to be very land intensive and are generally only suitable for areas where space is available and the cost of land is relatively low. Therefore, we believe that additional study of land use and economics issues (including the “opportunity cost” of land in an eventual market economy), would be warranted. Water The water supply for the City of Havana is separated into four systems (the Central, East, South, and West systems, Table 5). These four systems receive water from 42 freshwater sources (41 are groundwater sources and one is surface water). The surface water source is captured through a series of three dams. 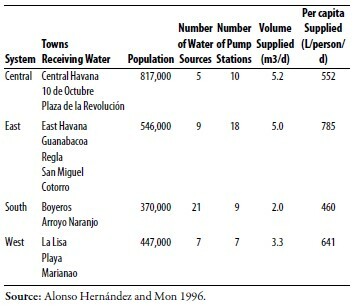 The total amount of water provided by these four systems in 1996 was 15.5 m3/s (Alonso Hernández and Mon 1996) and in 2007 was 18.1 m3/s (Cubagua 2007), with rates corresponding to roughly 650 L/person/ day. Water is treated within these four systems through chlorination, with an estimated chlorine usage of roughly 2.5 tons per day, to provide a target chlorine residual of 0.5 mg/L throughout the distribution system. During 1996 the distribution of chlorine was about 50:50 between chlorine gas (25 installations) and sodium hypochlorite (23 installations) (Alonso Hernández and Mon 1996). However, more recent data (Cubagua 2007) suggests that the majority of the plants have been converted to chlorination via sodium hypochlorite addition. Chlorine (gas chlorine and sodium hypochlorite) has been predominantly produced in Cuba within the Sagua la Grande Electrolysis Plant located in Villa Clara Province. Chlorine is produced at this plant through a process using mercury electrodes and in recent years this plant has not been operating properly, requiring that chlorine be imported from other countries such as Nicaragua and Mexico (Roberto Cardona, personal communication, 2009). The four water supply systems collectively include 44 pump stations which are equipped with 101 pumps in total, 374 km of transmission lines, and 3,594 km of distribution lines. The systems include a total of 13 water storage units of which 9 are in service (210,200 m3 capacity). The system lacks metering, which makes it difficult to analyze the flows (Alonso Hernández and Mon 1996). Loss of about 55% of the treated water within the transmission and distribution water lines due to leaks. The Central water distribution network is the oldest of the systems and is in very poor condition. Instability of the pumping stations which transport the water from their sources to the consumer. The instability is due to breakdown of pumping equipment which is in poor condition and the lack of back up pumps, lack of surge suppressors, lack of water hammer suppressors, lack of flow metering, and interruptions in the availability of electricity. Electric interruptions are especially problematic as groundwater wells lose their prime, which requires great effort to restore. Other miscellaneous items include: pumps which lack meters and so it is difficult to determine whether they are functioning properly, valves within the distribution system which do not function properly and so it is impossible to isolate sections of the system for repairs, systems that are not fully inter-connected, water storage capacity that is not sufficient, capacity that is insufficient to distribute water in some zones due to greater demand, and inadequate maintenance of the chlorination equipment. Water system priorities (Table 6) include replacement of the aging water distribution network. Alonso Hernández and Mon (1996) estimate that 1800 km are in extremely poor condition. The new innovative technology of pipe bursting, which can replace pipes without the requirement of open trenches, is estimated to cost of US$ 90 per linear foot for an 8 inch average diameter pipe (Mohamed and Hashemi 2008). The cost for replacing 1800 km of pipe is thus estimated at roughly US$ 500 million. This estimate does not include the costs associated with auxiliary components such as valves and metering. Earlier we have proffered qualitative judgment-based benefit-cost relationships (thus, priorities) for various wastewater and water infrastructure improvements. Actually, we recognize the limitations of this approach, and recommend that infrastructure needs for Cuba be prioritized using a more rigorous benefit-cost analysis methodology, for optimum allocation of resources. The cost component of the benefit-cost analysis is the easier to quantify. Costs can be obtained through traditional engineering cost analysis methods which take into account the costs of mobilization, materials, labor, and operation/maintenance. To complete a traditional cost evaluation, unit costs for materials and labor within Cuba will need to be quantified although today’s costs in Cuba may not be relevant during a transition period. In the meantime, in the absence of unit costs for Cuba, unit costs for other countries (e.g., developing countries in the Caribbean) can be used as surrogates for costs in Cuba In the absence of costs in comparison Caribbean nations, costs from the United States (and perhaps Puerto Rico specifically, considering geographic and technical similarities) can be used, noting that labor costs for U.S. and Puerto Rico would likely be higher than that for Cuba. The benefits of a particular project are even more difficult to quantify than the costs, because benefits tend to be intangible. We propose here two approaches to evaluating benefits. The first focuses on adding up all the benefits associated with decreasing environmental contamination. The benefits from, say, a wastewater collection and treatment infrastructure project would include public heath improvements, ecological improvements including better fisheries, and increases in recreational use of the receiving bodies of water. The result of improved public health can be in theory expressed in the number of illnesses that have been averted. In turn, the benefit of this illness reduction result can be quantified in terms of the monetary cost avoided of treating the illness and the monetary value of work productivity loss avoided. Ecological improvements have direct impacts on fisheries, and this benefit can be quantified through estimation of the monetary value of increases in fish and shellfish harvesting. Finally, recreation benefits can be expressed in terms of a monetary “willingness to pay” on the part of area residents and tourists. In some cases in the U.S., this willingness to pay has been estimated to be user fees paid by visitors to recreation areas, but it seems likely that such fees may underestimate the true value. The second approach to quantifying benefits would be based upon an evaluation of land value. One can evaluate the land value of Caribbean nations that have a market economy. The evaluation should include a comparison between land values for those areas which are contaminated versus those which are not. It is anticipated that such differentials in land values would be extraordinary given the high value of pristine environmental resources within the Caribbean through the tourist industry, especially for land located along the coast. Minimizing the contamination of rivers which drain towards the coast could potentially have major impacts on land value through the potential to develop the coastal areas for tourism. Both suggested approaches would require a considerable amount of additional research. For the first approach, because of the intangible nature of the many benefits associated with improved environmental quality, the evaluation would require an understanding of the impacts of infrastructure improvements on local biological resources and socio-economic levels for the local communities. For the second approach a concerted effort would be needed to evaluate local nuances associated with each area for developing the land. In both cases a full analysis of benefits would realistically need to involve eventual inputs from professionals in Cuba and a considerable investment of time and resources to obtain results which are meaningful. In the meantime we provide a case study conceptual illustration below. Phase 1: Rehabilitation of the San Pedro pump station and associated transmission lines with discharge to a minimally improved reservoir (Pitirre) for diversion of the wastewater away from the Almendares- Vento watershed into the adjacent Cojimar River watershed, thus removing a clear threat to public health in the water supply. Phase 2: Addition of primary treatment plant (primary sedimentation only) prior to discharge to the Cojimar watershed. Phase 3: Addition of biological treatment and secondary sedimentation prior to discharge to the Cojimar watershed, thus helping to achieve a Class B receiving water classification in the watershed, and its associated benefits. Phase 4: Addition of tertiary treatment prior to discharge to the Cojimar watershed, thus helping to achieve a Class A classification and its associated benefits. Cost estimates were obtained in several different ways. For Phase 1, the costs were estimated from wastewater treatment plant cost tables (U.S. EPA 1976, Cristina Ortega-Castineiras, personal communication, 2009). As mentioned earlier, available information suggests that the pumps are working at the San Pedro Pump Station; however the wiring and control panels are in need of repair. Thus two costs were estimated for this phase: the estimated cost for the wiring and control panel and the cost for a new pump station (8.25 million gallons per day, MGD, which would be capable of serving the entire population of Cotorro, about 82,500 people). The cost of the wiring and control panel was estimated from the 1976 cost tables at $82,000; similarly the cost of a new pump station was estimated at $572,000. Adjusting these costs to 2009 values (NASA 2009) results in present day value of $330,000 and $2.3 million, respectively. The cost of a new pump station was cross-checked against an alternative method of analysis which included the consideration that the cost of a new 6 MGD pump station recently built in Florida was $2.5 million (Cristina Ortega-Castineiras, personal communication, 2009). Adjusting the cost for the 8.25 MGD design flow for the San Pedro Pump Station and taking into account that the costs for construction in Florida are about 50% more than the cost for construction in developing countries (Peter Robinson, Hazen and Sawyer P.C., personal communication, 2009), the estimated cost for a new pump station in Cuba was thus estimated again at $2.3 million, which confirms the estimate computed using the wastewater treatment plant cost tables. For the purpose of establishing the costs for phase 1 and the uncertainty concerning exactly what parts of the pump station are inoperative, the cost for phase 1 was thus estimated at $2.3 million, taking into account that any cost savings from existing equipment and infrastructure at the existing San Pedro Pump station could be used towards potentially rehabilitating the pipe that transmits the water from the pump station to the Pitirre Reservoir. For Phase 2 and 3, the estimated costs were obtained from cost estimation tables established for the country of Colombia (Peter Robinson, Hazen and Sawyer P.C., personal communication, 2009). The cost for a primary treatment plant of 8.25 MGD is estimated at $24 million. The cost estimation tables were developed for full secondary treatment using activated sludge with pure oxygen aeration. Given that a trickling filter aeration system would cost less, the costs were adjusted downward accordingly to $18 million. For Phase 4, the estimated costs were obtained from the manufacturer of tertiary treatment equipment that were included as part of the student design team plan (Nicole Rodriguez, CDM Inc., personal communication, and Reshma Ramoutar, University of Miami, personal communication, 2009). The company estimated approximately $1.5 million for the equipment cost. Taking into account that there would be additional installation costs, this number was increased to $3 million for estimation purposes. Table 7 lists for each phase the infrastructure components, the approximate cumulative cost and the list of benefits (and conceptual means to quantify them). From this table, it is clear that Phase 1 (diversion) should be implemented, on the basis of the preponderance of benefits (even though not readily quantifiable yet) over the modest costs. Likewise, given that Phase 1 would be implemented, it seems justifiable to provide at least the modicum of primary treatment (Phase 2) so that public health issues associated with untreated wastewater discharge to the Cojimar watershed would be avoided. They key question then is: where should we draw the line? Should we stop at Phase 2, or should we proceed to Phase 3 (secondary treatment) or even Phase 4 (tertiary treatment)? From a financial perspective (availability of funds) it could be argued that Phase 2 is all that could be achieved. However, from an economics perspective (benefit-cost analysis) the answer is less than clear. Once the data are available for a full benefit-cost analysis, it is possible that Phase 3 or even Phase 4 may be justifiable, and if so, this conclusion should inform the process of allocation of economic resources island-wide. Tables 8 and 9 describe the incremental benefits of the various phases to the San Francisco/Vento watershed and to the Cojimar watershed, respectively. The first column of each table defines the benefit (and where possible a methodology to compute the benefit). The third column lists the data that would need to be collected, with the aid of Cuban professionals, to carry out the computation methodology. Much of this conceptual work is based on a wastewater treatment benefits study conducted for the island nation of Barbados in the Caribbean (Camp Dresser & McKee Inc., 2008) and would, of course, need to be adapted to Cuban conditions with more information. Cuba is in dire need of investment within its water and wastewater infrastructure system. Much of the existing infrastructure is over 50 years old, and as a consequence is deteriorated and in need of maintenance and repair. Newer systems appear to not function properly (e.g., María del Carmen Wastewater Treatment Plant) and/or appear to not be fully constructed (e.g., missing sewer trunk lines in the Puentes Grandes collection network) and so efforts should focus on maintaining and completing infrastructure projects that have been initiated. For the Almendares-Vento watershed, efforts should focus on protecting the potable water supply from contamination, in particular from both industrial and domestic wastewater discharges from the Town of Cotorro. Prioritization of water and wastewater infrastructure upgrades should be based upon a cost-benefit analysis which quantitatively ranks infrastructure projects in terms maximizing benefits for a given cost. This study provided some costs for upgrades to the Town of Cotorro wastewater treatment system. All of the costs listed were estimated at a conceptual planning level only, as detailed design drawings are yet to be prepared for each of the phases and the current status of existing facilities are not known with certainty. More work is needed in establishing the costs for the various upgrades and prioritization should be completed in coordination with local Cuban water professionals due to the intricacies associated with watershed and infrastructure management within the country. 1. The opinions expressed in this paper are those of the authors and do not necessarily represent the views of their employers or of their sponsoring engineering societies. Authors’ knowledge of Cuba is based on limited information available, mostly from the Internet and from papers published in Cuba. Authors would like to acknowledge the valuable advice received from Dr. Juan Belt of the U.S. Agency for International Development and Peter Robinson of Hazen and Sawyer P.C., as well as the work performed by C-AACE Board members Rodrigo Rodriguez and Victor Pujals. We also appreciate the work performed by University of Miami engineering students Cristina Ortega, Reshma Ramoutar, Karen Kajder, Jose Cueto, and Omar De Leon, and the review comments of many colleagues.